You are currently browsing the archive for the Birds category. We bought this ball of wool and yarn last year, but it never got much attention from the birds. This year, however, I spied a titmouse taking full advantage of it! We have a few squirrels that have gotten into our bird feeders. They’ve emptied our one “house-shaped” feeder so we keep it empty or filled with safflower, which fewer birds like. Then they started feasting on peanuts from the peanut feeder. And most recently, they’ve figured out how to circumvent our fancy squirrel-proof feeder. See? Luckily, this problem is easily remedied. 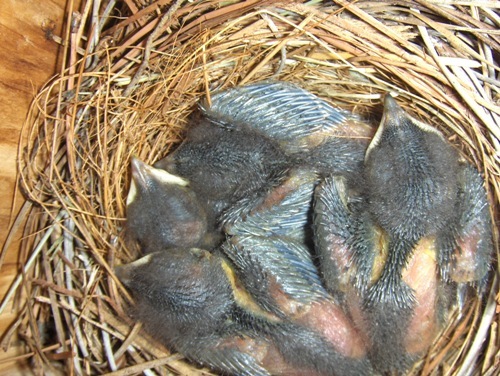 Blue Birds 2008 – First clutch! If you’re a long-time reader, you might know that we have bluebird house in our back yard, complete with a little video camera inside it. We can watch the video feed on the TV inside the house. Read more about our setup here. Well, this year we set the nest box out in the yard in February because we noticed the blue birds milling about the feeders. They started laying eggs last week and as of today there are already four eggs in the nest! Here we go again! I like to jokingly refer to their place as “the Ark” becuase they have so many pets and other animals. Now that they have little Evan Almighty, it’s perfect!! They have a few indoor pets: three dogs and two cats. Nina and Fin are chihuahuas, while Grayson is this teeny little miniature of a regular dog. Seymour is a total snugglepuss and ferocious player. Alabaster didn’t make it into the pictures somehow. The newest addition to their flock is, well, a flock. Five bantam chickens named Eleanor, Abigail, Chester, Teddy and Lucy. Chester and Teddy are roosters, and it’s still out for decision exactly what Abigail is. A prize for whomever can guess the naming convention for the chickens. There are also seven baby chickens that Monica allowed to hatch. They’ll join the rest of the flock in a few weeks. The best part about these chickens (besides the incessant crowing) is their cute feathered feet – how adorable. We enjoyed a bunch of fresh Banty eggs while we were there – yum! I wonder if our covenants forbid raising chickens?? They are getting bigger! We won’t be able to open up the nest box for very much longer. They’re all gone. All five of the bluebird baby birdies fledged today. We saw three of them leave! Here’s one planning his exit strategy. Sorry I’ve been so lame about posting this second clutch of bluebirds. We haven’t been as good about feeding them, either. Ah well. Anyway, here are some cute pictures and a video. I don’t really know how old they are, I haven’t been paying close enough attention. If someone wants, they can do the math for me. I’m not supposed to open the nest box after they’re 12 days old, and I think it’s close, but not sure. Judging by this guy’s athletic ability, I don’t think I’ll open the box again.